NetCrunch Tools is an ultimate network application especially designed for monitoring, enhancing and managing the network of computers running on Windows. The utility offers a complete set of networking tools like Ping, Traceroute, Wake OnLAN, Who is, Ping Scanner, DNS Info, Open TCP Port, Service Scanner, SNMP Scanner, DNS Auditor, and Mac Resolver to effectively manage and maintain your network of devices. This way it offers a complete and reliable solution in case you’ve to manage multiple computers connected together. 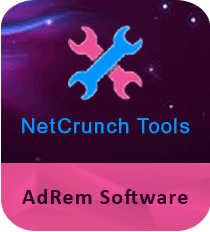 NetCrunch Tools is quite notable for its simple and elegant user interface. The program organizes its core functions into three groups: Basic IP Tools, Scanners and Subnet tools. All the tools are systematically organized within the app, thus, making it easily accessible for both beginners and experts. The utility also features one-click access to all the functions. The program flaunts old standards like Ping and Traceroute. Enter an IP address or domain name and click Start and the results will be immediately displayed. If you want to scan your entire network, you can choose advanced tools like Ping Scanner. Some tools like “Who is” and “DNS tools” give details about a domain name while others such as “Wake on LAN” lets you turn on a PC remotely by entering its MAC address. Other tools are used to list MAC addresses, available networks, open TCP port or some other tasks. You can also instruct NetCrunch Tools to check whether hosts in a specific IP range are reachable or not. The Windows software either works alone or in collaboration with the NetCrunch network monitoring system, the all-in-one network monitoring and management suite. It is completely free to use and doesn’t have any usage limitations. You can Download NetCrunch Tools to effectively manage your devices and networks. NetCrunch is one of the best network programs out there. It offers you the complete set of network tools for effectively managing the devices connected to a network. Moreover, the networking application features a lucid and intuitive user interface, which means you’ll face no problem while using it. You’ll easily get familiar with it once you start using it. Well all been said, NetCrunch is your safest bet for a simple and reliable networking tool. You must use it at least once to experience the usefulness and benefits of the system application.